I like talky movies, and thus I often like movies based on plays. The Ides of March is no exception. Although I am not familiar with the play upon which it is based, Farragut North by Beau Willimon, the plot of the film features a sticky moral quandary, an element that has been in vogue in American playwriting since at least Arthur Miller. George Clooney, director of the film, also acts a key role, that of a Clintonesque governor running for President of the United States. But that is not the end of his list of his credits for the film, he also gets screenplay adaptation credit along with previous collaborator Grant Heslov (Good Night and Good Luck). Reportedly he insisted on changing the title of the play to the reference to Julius Caesar. The “Ides of March” was the name of the 15th of March on the Roman calendar, the day Caesar was assassinated. No assassinations happen in this political thriller, unless it is the career assassination of Ryan Gosling’s character, Stephen Meyers, campaign spinmeister for Clooney’s Governor Mike Morris. Gosling is the star of the film, not Clooney, and although he does a fine job as a glib spinmeister, I much preferred him as the taciturn driver in Drive. Too much of his character is established by describing his facility with his job, rather than showing it. Even less is established about Molly Stearns (Evan Rachel Wood), a campaign intern with whom he begins an office romance. The turn her character takes late in the story is neither established well-enough, nor dwelt upon with the gravity it deserves. To ask us to care whether Gosling’s Meyers will come out on top in the backstage power struggle more than we care about the resolution of her story is its own exploration of moral equivalences. And, as long as we’re questioning the priorities of the screenplay, it is never clear to me why rival campaign managers sharing a beer would be a scandal. 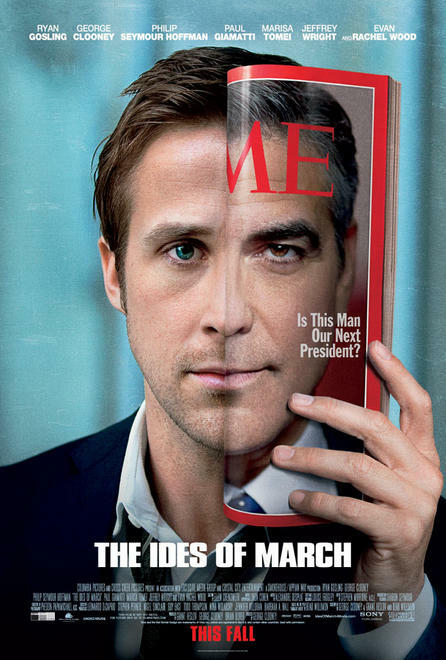 For all I like about Ides of March — it assumes an intelligent audience, it has a dark view of even the shiniest sides of politics, it wrestles with fascinating ethical issues — I can’t recommend it without qualifications. Based on my conversations with other people who have seen the film, the screenplay’s soft spots and Evan Rachel Wood’s inauthenticity are probably be too much for most moviegoers to overlook. Some have made hay of Clooney sending out political messages, effectively making a proxy presidential run through his character, Governor Morris. Without spoiling the end of the film, I’d say that, given what is revealed to be behind Morris’ messages of hope, the movie can only be read as a vicious critique of President Obama. Anyone who reads the film differently must be clouded by Clooney’s stated liberal views in real life. Clooney casting himself in the role is a brilliant stroke, not only playing as it does upon what audiences may already know about him, it allows him to reverse expectations with great dramatic force. Whatever his political allegiances in real life, in The Ides of March, his loyalty is clearly toward good dramatic storytelling. And for that, this film has my vote.